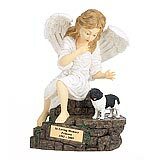 "I received my order on Wednesday. It is so wonderful. I was sort of skeptical about ordering this without actually seeing it first hand but I must say I am very with my purchase. You all did a wonderful job. Thank you for sending the extra name plate -- the green one looks much better." 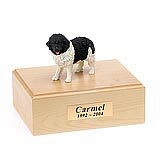 All available Landseer dog urns and memorials will be displayed with the figurine on the Landseer urn you select and in the appropriate size.